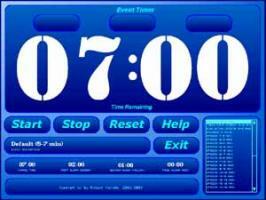 Handy little timer useful in conduting fixed time events. The timer is initiall set to the time allocated for the event and ten counts down to zero, at which time the event should be over. Alarm indicatiors are activated as the timer approaches zero. The exact times can be adjusted from the interface. Source code can be obtained from the website. This application was created with AGS 2.53 at 800x600 resolution. This is not a game, itÂ´s a design-program, but its very cool anyway !